The new GUARD-F12 is a EN50155 Class Tx certified firewall/router. The GUARD-F12 has been developed specifically for the use in railway applications and is based on the robust GUARD-F1. The GUARD product line is designed and produced by MPL AG in Switzerland. 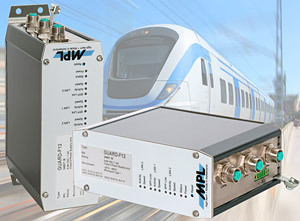 The GUARD-F12 comes with 3 Fast Ethernet interfaces and M12 connectors, ideal for rugged industrial and railway applications. The GUARD has specifically been designed for railways, industrial, and defense applications where security, quality, reliability, low power consumption, and long term availability are key. The GUARD-F12 is equipped with M12 connectors often used in railways applications. The housing comes in a small footprint and is available with DIN-Rail or Flange mounting and offers sufficient space to add other peripherals. The system can be customized for customer specific applications or uses. The GUARD-F12 comes pre-installed with an adapted version of OpenWRT (www.openwrt.org). This Linux based embedded distribution provides all functionality required for operation as IPV4 and/or IPV6 firewall and router. Most of the configuration of the firmware installed can be done using a web based interface. For more specialized requirements, a console based configuration utility is available. MPL's Railway Systems are EN50155 certified and undergo environmental testing to ensure reliable performance under a variety of conditions. For the climatic test, we have chosen the most severe test parameters from the Standard. The GUARD-F12 has been tested from -40°C to +85°C, called Tx in the EN 50155 Standard. It also includes the Railways Standard EMC and Mechanical tests. All required tests have been passes on the first go. Each GUARD delivered in extended temperature, will also be tested in our own climate chamber.